← Cookies Worth Fighting For??? GGC’s National Service Project is underway and Units across the country are learning about EmPOWERing Girls and taking action to raise awareness about gender equality and female empowerment. In Ontario, the 1st Mount Albert Guide Unit wanted to learn about female politicians making a great impact in their own community: the Town of East Gwillimsbury. 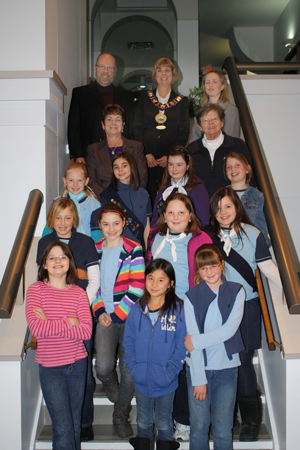 The girls met with Mayor Virginia Hackson and Council members of East Gwillimsbury, the vast majority of which are women. The Unit had an opportunity to ask the Mayor and Council questions about their ambitions and experiences in politics and then went to a council meeting about this year’s budget. As the 1st Mount Albert Guide Unit discovered, while the majority of Council members for the Town of East Gwillimsbury are women, this is the exception, rather than the rule. Women form slightly more than half of the Canadian population. Women hold 22% of seats in federal, provincial and territorial legislatures. Canada ranks 50th in the world for the number of women in politics. Mayor Hackson said that she had a vision for the community and things that she wanted to see done and decided it was time for her to step up and do something about them. Should Canada institute quotas either for the candidate selection process for parties and/or the nomination of female candidates? This entry was posted in Girls' Guides and tagged civics, National Service Project, women in politics. Bookmark the permalink.